HomeJewelryWhy is it Difficult to Sell Handcrafted Jewelry? Exceptional handcrafted jewelry is designed and handmade by talented jewelers and artisan-jewelers the world over. While many designers create entirely unique designs, others are deeply influenced by their region’s historic cultural and traditional styles.Jewelry expert Merlly Calisto works closely with hundreds of master artisan-designers in her homeland, Peru. There, she serves as regional director of Novica.com, a world arts website that assists thousands of artisans worldwide and features each artist’s biography and handcrafted collection online.In the following interview, Calisto discusses handcrafted jewelry as an art form, and traditional styles and materials of handmade jewelry in Peru. Calisto explains what she looks for when seeking new jewelry designers and collections, who she recommends, and how she became a jewelry expert.CG: Why does Novica specialize in handcrafted jewelry, instead of machine-made jewelry? What advantages does handmade jewelry provide over mass-produced designs?MC: Handcrafted jewelry is more challenging. You can feel the artist’s soul in it. For artisans, handcrafted jewelry provides the chance to explore your creativity, to give more of yourself and to make it true, without requiring the artist to invest thousands to get his or her idea developed. With simple tools, basic raw materials, and talented hands, artists can express their feelings and beliefs in this art form, and show off their unique designs and their inherited culture. Machine-made jewelry, on the other hand, requires a significant investment in machines, employees, and many other related costs, while it removes the creative essence from this art.CG: What are the typical styles of handcrafted jewelry a collector will find in Peru today?MC: The typical styles for collectors of Peruvian jewelry include Pre-Inca, Traditional, Colonial, and even Modern. We are recognized for our gold and silver mines, which our ancestors put to use with considerable dedication. The most popular use was for the creation of exquisite, carefully handcrafted jewelry. Our ancestors captured their beliefs in their jewelry, and the symbols associated with those beliefs. You will popularly find Peruvian jewelry featuring royal birds, felines, the Sun God, and so forth. Peru is the Land of the Sun. Our Colonial jewelry, despite of being the result of the Conquest of the Americas, shows what our ancestors began to create after they learned an entirely new culture. So our Colonial jewelry merges our ancestor’s unique talents with new beginnings, and typically features a heavier emphasis on flora, rather than the emphasis on fauna that their predecessors maintained. Nowadays the art of jewelry design is opening up further in Peru, becoming a more attractive field for new jewelers who prefer modern jewelry — inspired by our roots, but featuring more abstract shapes and ideas. This means that the Peruvian artist may still express himself in a way that is inspired by our culture, but merged again with new beginnings. CG: Can you describe more of the details one can expect to enjoy in Pre-Inca, Inca, and other Peruvian handcrafted jewelry designs?MC: Pre-Inca and Inca jewelry share similarities, because the Inca Empire resulted from the conquest of various Pre-Inca cultures. Inca jewelry expresses the Inca’s beliefs and cosmology. You will find images of felines, people, or birds decorated with snakes or sunbeams which express royalty, power and loyalty. Some of our Pre-Inca cultures used a simple, attractive style to express their beliefs, most of those are still commonly represented in artistry today, and not only in jewelry. Colonial style jewelry is considered an elegant style. A Colonial jewel design, or a Modern jewelry design inspired by colonial times, gives you the sense of seeing something designed for the Queen. Although we do not use diamonds, for example, you cannot confuse this style with a bijouterie — you will feel it as a jewel. Colonial jewelry and Inca-style jewelry are typically stunning handmade works of art, perfect for collectors.CG: What gemstones and metals are mined in Peru, and commonly found in handcrafted Peruvian jewelry? What about the quality level of those same Peruvian materials?MC: Nice question, I love it. Do you know why? The Silver Institute has named Peru as the first world silver producer — yes! — followed by Mexico. Regarding gold, we are the first in Latin America, and the fifth in the world. About quality, we are considered one of the best. 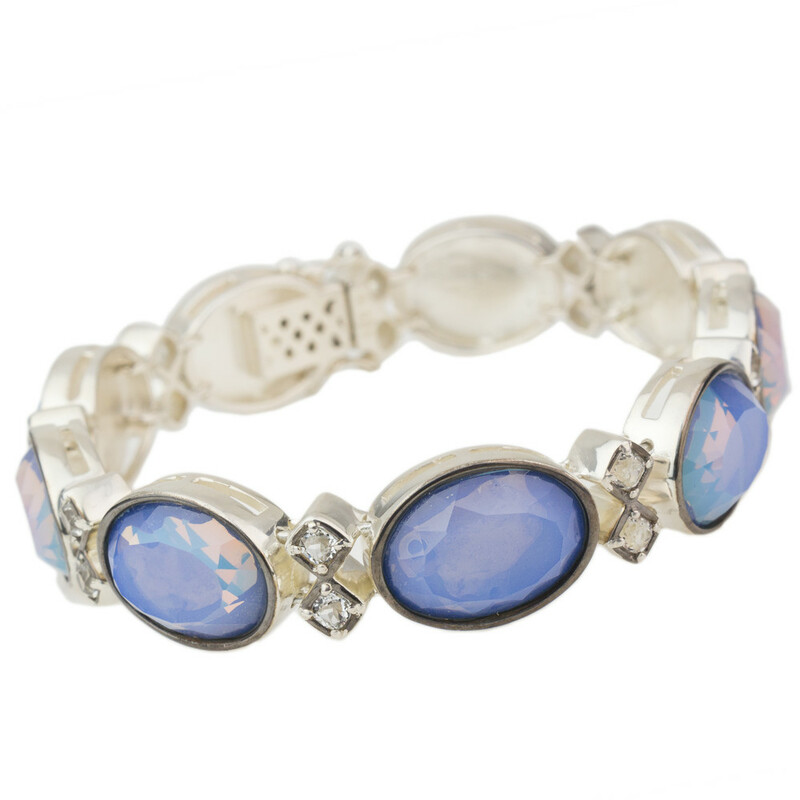 Regarding gemstones, we have a special stone, the Andean Opal. There is a lot of opal around the world, but Andean Opal is purely Peruvian. From this stone we have Crisocola, which was used by Pre-Incas in their jewelry. Other popular semiprecious stones are Sodalite, Onyx, Obsidian, Jasper, Serpentine, Angelite.CG: When you are considering representing new handcrafted jewelry artisans, what do you look for, in their design style, materials, and quality? How do you determine those factors?MC: What I look for first is the meaning of each design — immediately I imagine someone wearing it. Who would be the customer? How does he or she look when wearing this piece? Is it design for a market where the customer looks for something different, to convey tradition, culture, and soul? I usually look for some aspect of our roots, whether the design is modern or traditional. If it expresses Peru in any of its ways, it is of initial interest to me. I find myself grateful when the materials are Peruvian, especially our silver, gold, and local stones. Then, of course it must be carefully crafted and meticulously finished.CG: Can you please name a handful of your favorite handmade jewelry designers? Please describe why they are your favorites.MC: IIlaria is one of my favorites. She leans toward the colonial style we discussed, and she really designs for the customer, not for herself. You can view her collection at Novica, to see what I mean.Patricia Jara is another of my favorites, because most of her items are in the modern style that is nonetheless always inspired by Pre-Inca cultures. Claudia Llaury merges tradition with her way of expressing tradition, in a simple way, and she uses always local materials, including high quality silver. Juan Contreras creates lovely designs, especially his Inca-style designs, such as his “Veil of the Incas” collection. Claudia Lira’s quality is very high, and her jewelry shows that Peruvian artists keep innovating. Anna Lia and Adrian feature a fusion of ethnic elegance and Art Deco, although they do not always use local gemstones. I feel very proud to represent these and many other extraordinary artisans and designers. They are each showcased individually within our Novica Handcrafted Jewelry division. CG: What led to your experience in the handcrafted jewelry field? Did you begin as a jewelry artist yourself?MC: I think I am more theoretical than practical. On a personal level, I love jewelry. On a professional level, my experience in jewelry began with a job promoting Peruvian jewelry abroad. For that, I visited many small and well-known workshops to learn about all aspects of jewelry production. I was involved with metal industry deals as well. I participated in expert meetings at the National Industries Society and Mining Society.Personally, I noticed a lack of finishing expertise, especially in some of the smaller workshops, so I began to organize attendance for technical courses, and began designing educational workshops for small and new jewelers. I learned much over the years, but really never put this knowledge into practice as an artist myself. I have enjoyed participating in international jewelry fairs, including, for example, Iberjoya in Madrid, and I have attended international jewelry symposiums promoted by various international cooperation programs.I have participated in an important local silver contest called Plata del Peru, sponsored by Patronato de la Plata, as an invited judge. My years with Novica have broadened my experience still further in many ways. Meanwhile, the market has enjoyed great growth, and I now feel myself closer to the market at Novica. New jewelry materials and concepts are always wandering around the world, so I keep learning about what’s new.I enjoy visiting the Mining Institute, where one can learn much about local gemstones. And I have enjoyed taking some handmade jewelry classes to become more practically involved with our artists. Every so often I visit jewelry suppliers to see what is new, and to be updated about prices. I must stay up-to-date on all prices so that I can better assist artists, and understand their cost needs. It is a complex and fascinating profession!